It occurred to me, as I was plotting my year-long reading voyage around the world, that the first three books I had chosen were written originally in English. True, I was planning a "52-Countries" GR group read in June in South America, and I was trying to work around that, but there were other parts of the world I could have chosen to launch my reading journey; it didn't have to be Antarctica and the Antipodes. Perhaps, deep down, I was looking for a way to ease myself into challenging, if not to say problematic, territory. OK--I admit it--I am often wary of works of literature that have been translated. I know I am not the only person who can't shake this feeling that a translated work might be missing a particular something--that as his or her words slip through the translator's filter (and I know Ms. Grossman would hate that metaphor but more about her thoughts later)--something indefinable has drained away. Not just the word choice, but the writer's world view has been subtlety shifted, made less foreign as a way for the outsider's mind to gain access. My German book group, which read only English books, and in which I was a member of the selection committee, categorically refused to read books that had been translated into English; too much was lost in translation, explained one of the founding members, and so I dutifully helped to select many British Commonwealth (very heavy on the Bookers) and American novels. Sometimes I couldn't help feeling that they were right, that these well-educated, cultivated women, all fluent English speakers, and who were all frequent travelers to English-speaking countries, often missed something that seemed self-evident to native speakers. For example, during our discussion of "Clay's Quilt", by Silas House, several of the German women persisted in calling the roadhouse where much of the novel's action takes place as a "disco". "You've got to stop calling it a disco," one of the other American members said. "It's not a disco, it's a roadhouse." "But it's where the young people go to dance and drink at night," said one of the German women. "How is it different?" "Well, a roadhouse is located on the outskirts of a town. People have to drive there," I tried to explain. "It's a place where people drink too much beer and whiskey and get into fights in the parking lot. Maybe there's a shooting." I decided not to go further in this vein, as it would no doubt just add to the dim view most Germans have of American society, and instead studied the group of ladies, who were waiting expectantly. In their wool suits or their tailored slacks and blazers, nibbling on Bretzeln or Plundergebäck and sipping coffee or tea from our hostess's best china, they looked liked the solid middle-class and upper class Europeans that they were, and I doubted that any of them had been anywhere near a roadhouse, even to drive quickly by one on a country road. How to explain to them this sort-of American institution? I had a flash of inspiration. "Have any of you seen Thelma and Louise?" A surprising number of them had. "Well, the place where the two of them stop and where all the trouble starts--that's a roadhouse!" Nods all around. A cinematographic image had gotten through where words had failed. There were times, however, in Germany, where I thought that the culture gap was too great, and that any attempt to translate a peculiarly American idiom was doomed to failure, or worse yet, the almost-failure; a translation that succeeded just close enough to give the foreign viewer the cozy illusion of understanding. Take "The Wire", for instance. When I heard it was going to be aired on German television--and not subtitled but translated--I groaned. The translator's explanation in an interview that he would make Baltimore street culture (with slang sometimes difficult for even a middle class native-born speaker to understand, and like Shakespeare, needing a few minutes for the listener to shift mental gears) intelligible to a German audience by having the drug dealers and hookers make errors in their genitive and plurals did not increase my confidence that the German audience would truly be transported to a rough Maryland port town. But isn't it better to try than to not make an attempt at all? I wonder if part of my unease is due to possessiveness of my own culture, and a defensive irritation at the outsider who thinks he or she "understands" another culture--in this case American culture--by dipping a toe into it. ( I'm certainly guilty of this mindset myself--and I often had to remind myself that no matter how well I spoke the language in the various countries I have lived in--even the UK--there would always be gaps in my comprehension.) I know I am not the only person who thinks this way. After reading "Cloudstreet" I went onto several Australian book blogs to see what Aussies thought of the book. One Perth book blogger wondered if only "Sandgropers" could really "get" the book and grasp the Perthiness of Tim Winton's novel. I wondered at this blogger's emphasis on the particularity rather than the universality of "Cloudstreet", which has been described by many reviewers as The Great Australian Novel, and has been translated into a score of languages. And then I thought, well, how do you translate "the chooks were racked along their perch like mumbling hats" or "they [people] are flurrying down there like maggots in a Milo tin" in Italian or Malay? Is it really possible without the work transmuting more into the translator's vision? The answer is--no, you can't--not really. I've sometimes read translated works that I know had native readers grumbling since, in pre-internet days, I didn't know which translation came closest to the ideal, or because there was no other choices. Kristin Lavrandsdatter is a good example. I was put off by the faux archaic language that Charles Archer used in translating the work into English, but persisted anyway as it is still a great work of fiction. A friend of mine on GR (who is also doing the 52 countries challenge) stated that though she doesn't read Norwegian, she can tell through that language's similarity to Swedish that the text is also riddled with errors, and has a ponderousness that doesn't exist in Sigrid Undsett's original. Hans Christian Anderson, too, is another whose language has often been saddled with a prissy stodginess that the author, known for his fresh colloquial style in his native country, isn't guilty of in the original Danish. I would like to read Tina Nunnally's fairly recent translation of Undsett's masterpiece, or seek out newer versions of Anderson's tales, but my time is limited, and I don't usually spend it in re-reading. I hope I can get around to reading Undsett's trilogy one day, in the style that the author originally intended. Of course, as I read neither Danish or Norwegian, I can only take better-informed readers' word for it that these works don't capture the spirit of the original works. I can say, however, that in the foreign languages I know well enough to read--Spanish, Italian, and German--the translator often gets things wrong. How do I know this? It seems a bit counter-productive, but I have learned, for me, the best way of easing myself into a foreign language is to start off by reading English books that have been translated into the language I am trying to learn. For one thing, I usually know the text, and I have come to realize that often the original author's idiosyncrasies of word choice or syntax are smoothed away by the translator's hand, particularly a mediocre one. As a result, it makes for easier reading. Surely, the translator often seems to be saying, the author really didn't mean to say THAT--I'll just go ahead and "fix" this little error. Or perhaps the translator lacks the skill in his own language to adequately adapt a challenging metaphor. In Grossman's book, she relates the anecdote of the Spanish translator who, when queried in an interview if his Spanish was up to the task of translating the work properly retorted that, on the contrary, he hoped his skills in his own language would do justice to the Spanish master's work; but I am getting ahead of myself. You can also learn something about the new culture through the struggle of the translator's attempt to serve as bridge between the two languages. So how do the translators of Lo Que el Viento Se Llevó and Via Col Vento and Vom Winde Verweht fare when grappling, say, with the intricacies of the slave dialect in Margaret Mitchell's book? Answer: not very well. (Tolkien has a better time of it in The Lord of the Rings: the formal "you" in Spanish, Italian and German seem tailor-made for High Elvish.) Often I would be slightly exasperated: why such a (excuse the pun) long-winded title in Spanish and why oh why do the Italians insist on calling Scarlett "Rossella"? Yes, I KNOW that's the literal meaning of the word, but all the sharp spunkiness of Margaret Mitchell's name for her heroine is wiped out in favor of the mellifluous, slightly languorous Ros-sell-a, who seems, in her new incarnation, to lack the energy to ring for her maid, let alone fight off a passel of Yankees. Titles, particularly, seem to fall victim to a deadening lowest-common-denominator obviousness. I was going to go digging through my boxes of foreign books for examples, but instead of having to run to the basement, I realized that I had a perfect example literally sitting in my lap in my e-reader. "Noli Me Tangere" is one of my two selections for the Philippines; this great protest classic, which was instrumental in igniting the independence movement in the islands, has been translated into dozens of languages. Why oh why is the French title "The Land of the Monks" (since the original title is in Latin one would think that a Romance language reader would have an instinctive grasp of the meaning) and how did the title in English end up being "The Social Cancer" (ugh) or "An Eagle Flight?" I think that perhaps José Rizal, one of the great polyglots in history, a man who could speak at least twenty languages, put a lot of thought into his title, and if he wanted his book to be called "Touch Me Not" in Latin, he had good reasons for doing so. Like perhaps immediately calling to mind the remoteness of the Catholic Church in the Philippines. Why do translators do this? Perhaps they fear that a too-odd title, or one that isn't accessible enough, will scare potential readers off. American publishers, of course, are just as guilty of this peccadillo. "Harry Potter and the Philosopher's Stone" was changed by the American publisher to "Harry Potter and the Sorcerer's Stone" as it was believed that an American audience wouldn't understand the meaning of a philosopher's stone. Maybe they did make it a bit more intelligible to the average reader, but a bit of the Dr Dee-stuffed-alligator-swinging-from-the-ceiling alchemical strangeness was lost in the quest for clarity. My thoughts as an accidental life-long language student and amateur translator have made me aware of all the pitfalls that await scholars more skillful than I am. 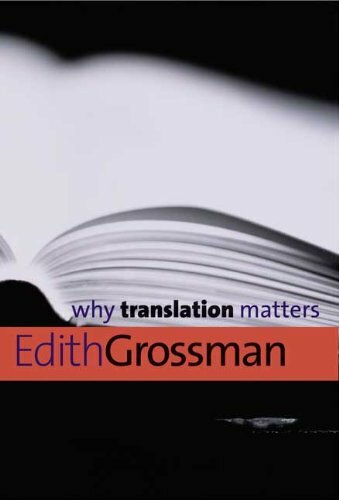 While I was researching this topic, and thinking about the general aversion to translated works, I came across this article from The New York review via The Huffington Post on Edith Grossman: http://www.huffingtonpost.com/2010/07/15/the-state-of-translation_n_647996.htmle. I was familiar with her work as I had used her translations of Spanish and Latin American novels while I was living in Spain; I thought reading her thoughts on translations would be a great way of starting my year of (mostly) foreign reading. "Why Translation Matters" was actually delivered as a series of three lectures at Yale University, which were subsequently gathered together by the university and presented in book form. It's a very slender volume, a little over a hundred pages long. The first part of the book is a brief history of translation, its continued importance in modern society, and a plea that translators should get more recognition for the important work they do. It's true that translators don't get much respect. I think especially on how opaque some of the descriptions of translated works can be while I was searching on the internet for my own reading list; Amazon usually (though not always) supplies the translator's name; my own library system, Fairfax County, which is generally rated as one of the top library systems in the country, often does not, and it has been a real struggle to find the "right" translation of many celebrated works. I had an especially difficult time with my Japanese novel; more on this when I get to Japan. Unfortunately, in her zeal to get her point across--that translators deserve more credit-- Ms Grossman engages in a great many ducking and weaving rhetorical tricks which do no credit to her reputation, and weaken her argument. Take her claim that only three percent of all offerings by American publishers comes from translated sources. Yes, it's an abysmal statistic, all the more so since the English translation often serves as the linguistic bridge between two less frequently spoken languages; the English language has to be done, say, before a work can be translated from Czech to Cambodian. After all this finger-wagging, she goes on to state that this situation is much better in Europe--ten times better, at least. Also accurate--on the face of it--but after living many years in Europe, I can't help but think: if you remove the cultural behemoth that is the United States/UK literary world--what is the percentage of non-English translated works available to the European public? Ms Grossman doesn't tell us, and so her argument descends into the purest sophistry. Ultimately it's a useless feint of numbers. Questionable, too, are her complaints about the invisibility of translators. How she hates the words that are often used in reviewing a translated work; the damning faint praise of "seamless" and "able." Translators must be judged on their own merits! But how, the reasonable reader can wonder, DO you judge a work when you can't read the original? But Ms Grossman wants more than that, though she doesn't tell us how. She is reduced to foot-stamping petulance and more repetition of this theme. Well, perhaps this worked better on stage in front of an audience. Ms Grossman is on more solid ground in the second part of the book, where she describes her work as a translator of fiction. Her major point is that a translator can't be expected to do a word-to-word swap; such a method would result in, at best, a wooden text, or at worst, a ridiculous or unintelligible one. This is a reasonable, even overly obvious claim. She is brilliant when working with prose, and I enjoyed her explanations of how she dealt with many famous South American and Castilian works. I'm less sanguine, though, about her claims that a translator is more of a collaborator that a transmutator; my own feelings are that a translator is best when he or she drops the ego and keeps out of the way. I think that Ms Grossman seems to have her own problems with that requirement; everything she has translated seems to have been of earth-shattering importance. It grows a little tiresome. The last section of the book deals with poetry in translation. "Poetry is what gets lost in translation," said Robert Frost, but Ms Grossman is determined to prove him wrong. She analyzes several poems line for line, and explains why she made the linguistic choices she did, paying as much attention to meter and to rhyme as to word selection. The first two poems are excellent. The third, a vanitas poem by Sor Juana, is problematic. Ms Grossman gets all defensive about the words she inserted, addressing one critic by name as she explains why she did what she did---but guess what? I actually agree with the criticisms. Much of the harsh austerity of the poem is wiped away by her superfluous insertions (Spanish can actually be a very terse language); it's just not a very good translation. In the end, I was left with some ambivalence. I still love her work with the great South American novelists such as García Marquez, but I'm left with some rather negative feelings, which I hope will fade by the time I reach South America. I am not sorry I read the book, as it is still an important topic, and a timely one for me as Hans Koning, the translator of my next book, describes--on the very first page-- the reluctance of Americans to publish works in translation and his problems in dealing with Maria Dermoût's "The Ten Thousand Things." My emotions on translations remain mixed--I still want to read translated books to gain some insight into another mind-set, but the same time can't help but think that I will inevitably not enter that world entirely. My slight trepidation hasn't gone away. I think that I have to accept that there will always be a veil between me and the original work; how thick that veil is depends on the skill of the translator. Y finalmente de quien el texto? Who do words belong to? o de los idiomas or to language itself?